After loving the previous book in the series I was so pleased to get my hands on an early copy of Unveiling Venus to follow Ophelia and the next part of her story. Luckily for me this story was just as wonderful as I hoped. The rich detail throughout really gives the reader a sense of the historical setting Ophelia is living particularly the real contrasts faced by those at either end of society. I loved seeing both through Ophelia's eyes as she experiences both. 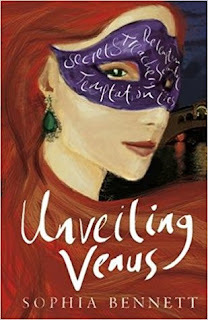 The part of the book set in Venice was really enjoyable as you get to experience that world along with Ophelia and it is clear the author's passion for art shines through every page. I also enjoyed getting back to England with Ophelia and seeing her as she is put in an impossible situation whilst trying to help her friend. In short I loved it and very much hope another book in the series will appear.